ADFX Awards | How Three found a way to deliver long-term vision without sacrificing short-term gains. Turning Brand Truth into Brand Response - Three does Mobile As It Should Be. In the past, accepted wisdom argued that there were two types of advertising campaign: Brand campaigns which sought to shape consumer attitudes over time and Direct Response tactical campaigns which tried to give promotional reasons to ‘close the sale’. However in recent years, there has been strong commercial evidence that we can also develop Brand Response campaigns, which create long term emotional bonding AND short-term reasons to buy. By 2012, the Irish mobile sector had started to stagnate. It was dominated by three big players – Vodafone, O2 and Meteor. In contrast Three mobile was in distant fourth place with 6.2% value share. It built its business on short-term tactical communications so consumers had no long-term reasons to choose the brand or stick with it over time. The marketing and agency team identified a positioning- Three: Mobile As It Should Be – which allowed them to build emotional connection on human insights and also communicate specific product and service innovations. This is a case which clearly demonstrates the sustainable value a Brand Response campaign can deliver to a business. By the end of 2012, the Three brand lacked clear direction and despite great products, it didn’t really stand for anything. The Three marketing and agency team worked with Red C research to identify a positioning as Customer Champion which allowed Three to capitalise on its market leading propositions like ‘All you can eat data’ but also build strong consumer connections based on insight. This led to the development of a campaign proposition around ‘Three: Mobile As It Should Be’. Three developed distinctive emotional creative work around the true meaning of Christmas, the true meaning of communication ‘Three Little Words’ and the lows and highs of being an Irish soccer team supporter. The media strategy sparked curiosity by following the true interests of existing and potential customers. There were innovative firsts around video-on-demand, using the whistle-stop break on Sky Sports, using curtain creative on MSN and using digital as a brand building tool. Three’s value market shared grew from 6.2% to 8.3% in just 12 months. Three moved their proportion of sales on Bill-pay tariffs over €40 from 2% to 24% year on year. Pre-Pay SIM’s sales increased by 26% from 2012 to 2013. 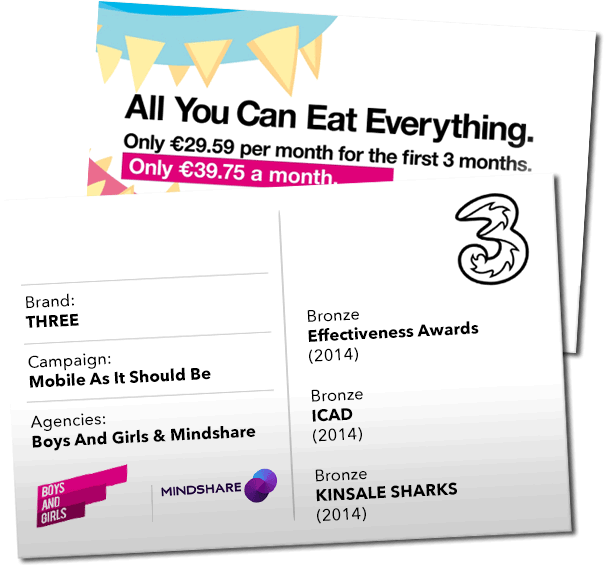 Three invested more media share of voice to demonstrate their business commitment to their new campaign. Based on assumptions of Life Time Value, the return on investment in creative and media communications (ROMI) for 2013 activity was €1.92 for every €1 euro spent. The results to date from this Brand Response campaign are very encouraging over only 12 months. It will be great to see how this continues over a longer time-frame, in line with international and Irish commercial evidence. There is great synergy between communications and product innovations within the ‘Mobile As It Should Be’ positioning. It will be very interesting to isolate the different contributions of communications and product innovations to building the Three bottom-line. This is the story of how Three found its way, turning the mobile brand around with an idea that delivered a long-term brand vision without sacrificing short-term gains. The campaign approach was broad enough to integrate big emotional messages about the true meaning of Christmas or being a die-hard supporter of the Irish soccer team with focused product messages about ‘All you can eat data’. This is a story of a Brand Response campaign as it should be. What more can we all do for our cases and campaigns? If you found this case inspirational, please go to the IAPI data-bank – http://adfx.ie/databank/ for more examples. If you want to make a stronger case for marketing investment to the Boardroom, read A Line in the Sand (2015). Findings from a meta-analysis of IAPI effectiveness cases by Karen Hand and Jill McGrath. If you want insight on how to design and execute campaigns that will continually deliver better commercial returns, read I Must be Talking to my Friends by John Fanning.